Edited by frostymuaddib at 16:54, 10 Jan 2016. Well, it seems that you either got some "optimized" version or Polish Golden Version by itself has some important original files missing from it (probably some that were considered "unused"). It is not guaranteed that installation will work on anything other than SoD or Complete edition (as clearly stated in main topic). Also, it is possible that you don't have enough access rights to the place, where you installed HotA. And also, it is possible that something went wrond during the donwload of HotA files. Problem solved - I've downloaded HotA from the updater instead, and I'm happy to report that it's working perfectly. Like you said, it must have been some sort of error with the downloading itself. Edited by phoenix4ever at 00:24, 19 Jan 2016. This is a small bug, but still a bug. Maybe the same happens with Town Portal, I don't know. It's a minor bug, but still nice if it could be fixed. I don't know if this is a knowed bug and I didn't bother to read the entire thread, sorry. If you have a tome of the respective school equiped, the level 4 shrines say the spell is already learned even if it is not. I'm having a bug in multiplayer. hd+ mod and Hota installed. Playing with 2 friends trough hamachi using tcp/ip. After setting a match with us 3 in other side and bots in other side in random map and setting all "More options" to "No" we get a game and everyone gets connected. Problem comes with simultaneous movement. We haven't set it on and first 2 player can move in the first day and 3rd cannot. The game crashes for the 2nd player after the 1st player ends his day1. Game then keeps going for the 1st and 3rd player. Edited by Sav at 11:59, 25 Feb 2016. Probably it is problem of last HD-mod version. Try to use previous one until it will be fixed. You can remove last update in HD launcher. UPD: fixed in new HD-mod version. Some very weird bugs occurred in our last 2-player multiplayer match, simultaneous turns on, HD version 4.100 RC11. My friend captured an originally neutral castle. A few weeks later we noticed the AI started using Town Portal on it, while it was still under his control. We didn't pay much attention to it then, but only noticed after we killed off the AIs supposedly last hero that the game didn't finish. I even used Expert View Air to scout the map and sure enough, there were no enemy heroes or castles left on the map. We waited around for a few days, and suddenly the AI buys a hero on the very same castle it used Town Portal on earlier, still under my friends control. In the end we were unable to finish the game, because the AI wouldn't leave the castle and we weren't able to attack, since it was still considered a friendly castle. Other funky stuff occurred as well, such as the AI buying a hero that we owned, and the game crashing every 5 minutes toward the end of the game ("This was not supposed to happen but it did happen"). I don't think this is a HotA bug, but probably an original bug. Edited by bloodsucker at 20:15, 12 Apr 2016. That is a bug but from the original developers. Originally in RoE it was impossible to cast any spell on cursed ground, then in AB they changed it to only level 1 (wich is pretty easier but also a non-sense) but didn't bother to actualize creature habilities. Edited by phoenix4ever at 20:53, 12 Apr 2016. But would'nt you agree it should be fixed? It also affects Master Genies, Ice & Energy Elementals, Enchanters and Fairie Dragons, which actually means Stronghold, Tower and Conflux are weaker on Cursed Ground. <AppPath> = "C:Program Files (x86)3DOHeroes 3 Complete"
<Unique System ID> = "MEF"
Hello all, I'm new to all this new updates, just fond it yesterday and was pretty axcited about it, cuz I play HOMM for a long time since Heroes 2 and I love this game! So I've downloaded it yesterday and checked it out. 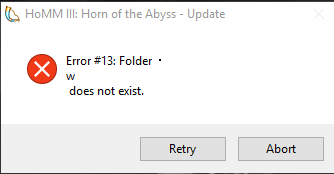 First of all, I must say a big applause to the team who made the new features, and that the new Horn of the Abyss is cool! and the new Cove Town is awesome. 1) The Oceanids creature defence is very weak, i can have 200 of them and and 2 strikes they die like nothing cuz of their 1-2 damage defence and 4 helth. 2) There's some bug with the new update, it's not allowing me to update. 3) There's a tiny bug whem the heroes doesn't has a Spellbook, and entering inside The Shrine of Magic, and do not show the spell picture or saying anything like "the hero don't have a spellbook". 4) I've noticed that every time I enter to a monster building or inside the town it's showing the "Recruit" set on "1" by defult and not "0". I hope my report will help somehow. Remarks about statistics in the game (like the power of oceanids) should be placed in proposal/wishlists since it's not really a bug . (also they have 1-3 upgraded damage and rock with bless). I don't know about the spells with spellbook problem, that might be something for the developers to look into. 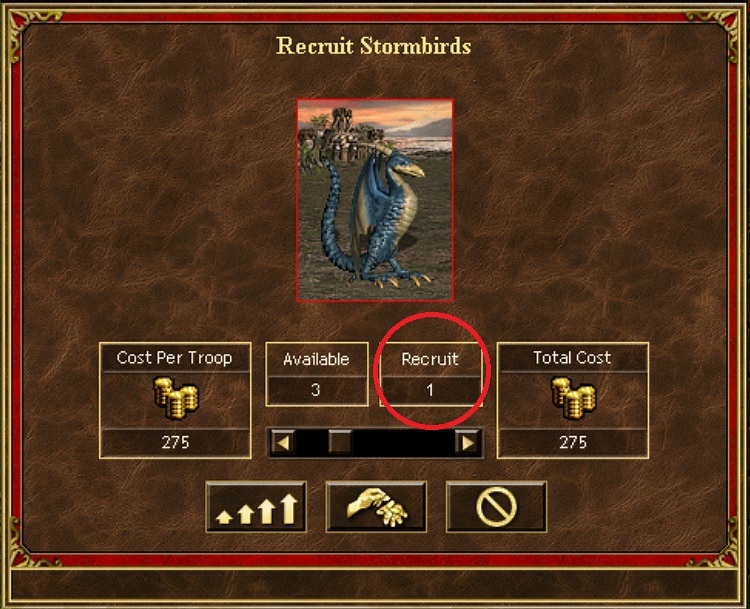 About the creature recruitment set to '1', it's something caused by the HD addon (and not HOTA itself). Start the HoMM HD program. (additionaly you can also set <UI.RecruitDlg.AutoSet.Max> = 0' to 1. Now when you click on a dwelling the game will offer you the maximum amount of units available right away. Edited by Maurice at 00:45, 25 Apr 2016. This is actually by design. They're glass cannons, so to speak. They can deal a lot of damage, but they can't take much and die easily. Luckily, their growth rate is also pretty high. Furthermore, they're teleporting around the battlefield, so essentially you can compare them to pixies. Those die like flies too (pun intended ). Do you know anything about the update error I got? it's happened when I run the game, but now I don't see it anymore. About the spellbook, it's happening when I enter inside a Witch Hut as well. The 3rd mission in the latest campaign seems to I think be buggy, the eastern cove town (south of the area with monks) the enemy owns is completely isolated and can only be accessed through sea (but there's no shipyard for the AI to get it). The mission is way too easy as with just Jeremy and Bidley you can take out the 2 pre-garrison Towns and then route your forces and 1 shot any other enemies. Also there is a campfire which you can't use in mission 4. Here's the one, its in the top-right area : https://i.sli.mg/GTrr7K.png You can just walk over it or stand in it and it does nothing. Is there a possibility of an option to purchase a spellbook at spell shrines? This is already in fheroes2 and I miss it in H3 HOTA. No you can't. I also asked for this feature in the HotA wishlist/proposal thread not long ago, as I would also like this feature.